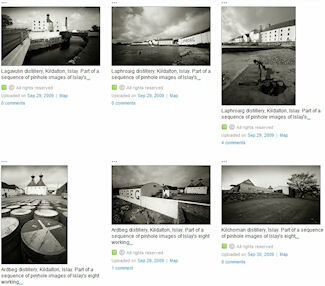 Almost all of my Islay pictures were shot with a digital camera, except for the very early ones from 1998 and 1999. I suspect it will be similar for many others and almost all new pictures taken on Islay now are with digital cameras. But there's at least one photographer who hasn't given in yet (and funnily enough he's a digital media designer). His name is Ian Phillip and among other things he dabbles in pinhole photography. From what I understand a very slow way to take a picture, in a way fitting to whisky which takes a long time to mature. While he hasn't taken any pictures of the whisky maturing as such he's taken pinhole pictures of Islay's distilleries in one of his recent projects: Islay Distillery Pinholes. I really like this one of Laphroaig distillery with the huge (cloudy) sky above. Also very nice this different than the usual view of Bowmore distillery. PS: Among his sets I also spotted a set Islay, March/April 2009. While not pinhole they were all shot with old film cameras, most of them in black & white. Some great pictures in there as well.